Sydney jazz singer, Kirsten Allison is a vocal stylist as well as a sincere and dynamic performer. Expect a creative blend of old and new as jazz standards and new music are interpreted with skillful vocal beauty. Kirsten graduated from the School of Music at the University of New South Wales, then continued her studies in jazz with Kerrie Biddell and at the Sydney Conservatorium of Music. 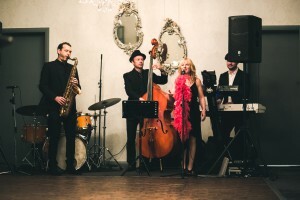 Kirsten and her jazz band are highly sought after for corporate events, festivals and venues. Click here for booking information. Not only a Sydney jazz singer, she is an accomplished international performer, having delighted audiences in Europe, the UK, Japan and Dubai. In Australia, Kirsten has performed alongside Vince Jones, Emma Pask, Wendy Matthews, Andrew Oh, and in venues such as The Basement, The Opera Bar, The Argyle Hotel, The Tilbury Hotel, and at events such as the Bledisloe Cup, the Sydney Food & Wine Festival, and the Kuringai Jazz Festival. Kirsten’s Sydney jazz band draws on the finest local musicians and is a highly sought-after act for festivals, venues and wedding reception music. As well as performing, Kirsten is also a sought-after Sydney singing teacher, conducting singing lessons in Sydney’s inner west. Click here for more information on Sydney singing lessons and group singing classes.